This luxurius 2 levels 3 bedroom, 2.5 bath beachfront condo apartment is a penthouse unit located in the gated Playa Almirante condominiums, just 5 minutes south of Rincon. It is beautifully decorated throughout with rustic furniture and art works. It also offers ready access to hotel facilities next door, including water sport rentals. The unit comes equipped with all amenities, complex swimming pool, private parking for two vehicles, and more. The balcony of this unit offers an excellent ocean, pool and hotel view. Shopping and restaurants are within walking distance, or just a short drive away. A 3 bedroom 2.5 bath condominium apartment with fully equipped kitchen, TV w/cable, electric stove with oven, microwave, dishwasher and all appliances, ceiling fans, central air conditioning, Queen Bed and lounge area with comfortable furniture, full bath and walking closet in Master, Full Bed in 2nd Bedroom, thrundle in third bedroom, all bed linens, washer & dryer, two assigned off-street parking spaces, a covered furnished balcony with hammock and great ocean views, it also offers great views from kitchen and master bedroom, 2 swimming pool, tennis courts, located in a quiet gated and secured condominium community just south of Rincon Puerto Rico. Monthly Rates Available. Call for corporate rental rates. 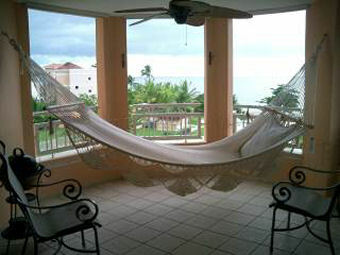 This Puerto Rico beachfront vacation rental apartment is located south of Rincon. Playa Almirante is a golden sandy beach suitable for snorkeling, whale watching, water sports; or just simply walking the miles of beautiful and scenic beach. Or if you like, just sit back and relax in you own covered balcony, and enjoy the surf and the beautiful sunsets each day. This home offers all the amenities you expect in a vacation or corporate rental. 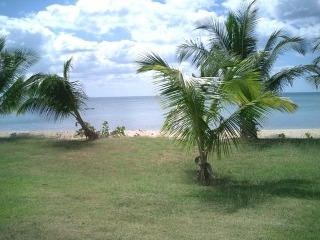 It is located just 25 minutes from Aguadilla and 15 minutes from Mayaguez. Many of the pharmaceutical companies in Añasco, Mayaguez, Rincon, Aguada, and Hormigueros place their travel employees in this complex due to the hotel amenities nearby.